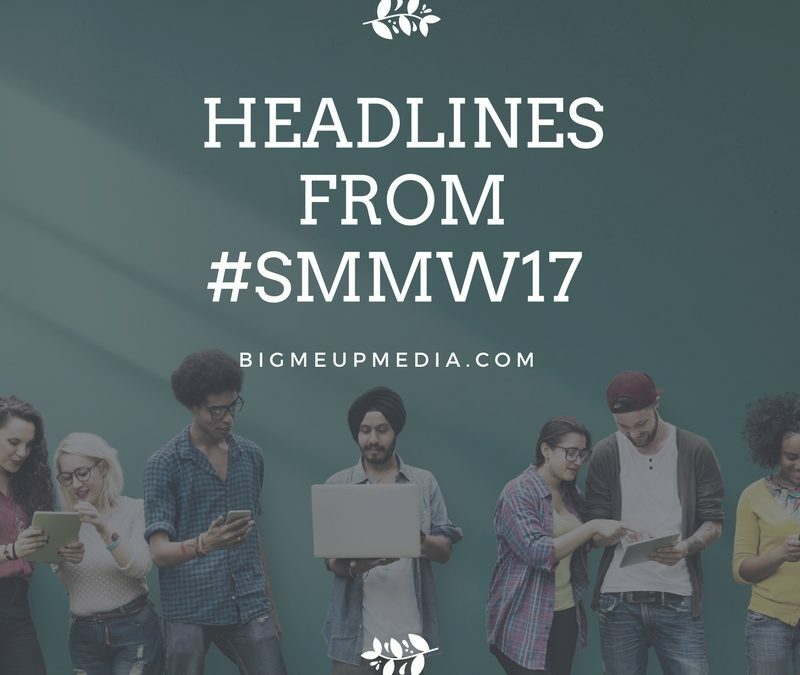 The headlines from the Social Media Marketing World Conference. Yes I am back from America after flying on a red-eye last night from San Diego to London and today I’m not even sure what day/time it is – I just know I’ve been up since 3.30am buzzing with ideas. So today I thought I would start emptying my head of all this great information I’ve accumulated over the past week and share some of the headline news with you. Did you follow my journey on Instagram Stories and my Facebook Page? What did you like best? I tried to show it all to you with my live reports of the key note speeches to the drunken nights out to the amazing sights and sounds of California. If you did miss it you can still catch some of the footage here. Over the coming weeks I will be giving you lots of takeaways that you can use to help you grow your business using social media – there were 120 expert speakers and big brand names likes Apple, Cisco and IBM all under one roof delivering tons of content. I still have all the recordings to go through as well as the highlights from the lectures I attended. So first I thought we would start with what’s hot and what’s not. So here’s some of the headlines you need to know about. 1: Live Video is SO hot – it’s the only way you can bust through Facebook’s algorithm and get your posts seen nowadays. There were 10 lectures on this subject alone this year. Are you doing them yet? Test it out in your groups if you are too scared to go public straight away. 2: Messenger Day is set to become this year’s BIG THING – according to Michael Stelzner (Social Media Examiner) in his keynote speech. Get on it now and be an early adopter to stand out in the market place. 3: Instagram is really hot – with just 600 million daily users it’s a place you can get noticed and it’s a place where you can easily connect with influencers – who do you want to talk to? 4: The Bots are coming – Virtual Reality – augmented reality and automation really is the future and it’s happening FAST. You will soon start to see how it helps you to sell on platforms like Messenger when they start rolling ads out. 6: Influencer marketing is HUGE and so if you know someone who can help you promote your goods/services with a selfie or a hashtag now is the time to cash in on that – literally – it’s never been easier or cheaper to get influencers on board and it won’t last long – expect to pay 10 – 100 or a 1000 times more in years to come. 7: Twitter and Snapchat are still in the game. 8: Relationships are everything when it comes to marketing and it doesn’t matter which platform you pick the deal is always in the people. Being more human will always help you win – what elements can you add to your business to make it more human? 9: Dark Social is emerging – this is private messaging using email or messenger or mobile apps like snapchat and Instagram. I use this a lot in my own marketing and it’s partly what helped me create the sell-out launch for Dream Life Academy. You don’t always have to be in the public eye. Is there a dark launch you could do to sell a program or service? 10: Short term content is anything that’s there one minute and gone the next – think Messenger Day – Instagram Stories – Snapchat – it’s a trend that’s actually not going to disappear itself and is here for a while – all you have to do is think how you can integrate it into your own marketing. It’s great for flash sales and letting people see behind the scenes of your business. So there you have it – my initial thoughts on what’s hot and what’s not. There’s a couple of big players right now with Lives – AI and Messenger. When it comes to what’s not hot – nothing really stands out. There wasn’t so much talk about Podcasts this year but they were really hot two years ago and are still part of the big picture. Pinterest is not so hot here in the UK as it is in America but you could make it hot for yourself by being the one who stands out on that platform. Whether you choose Snapchat or Instagram – Facebook or LinkedIn is irrelevant in a sense because you want to be hanging out where your clients are and that is a very individual thing for each and every business. Love your post thank you for sharing. Thanks Natalie – so happy you enjoyed it.